Notes: Carnarvon Morfa station was the western terminus of the Carnarvon & Llanberis Railway (C&LR) which was authorised on 14 July 1864. The line initially ran from Carnarvon Morfa to Llanberis and was 9 miles in length. Although the first sod was cut on 15 September 1864 progress was slow as the C&LR struggled financially from the start. During the 1866 financial crisis work on the line stopped completely. The London & North Western Railway (LNWR) offered to buy and complete the line using the threat of an alternative Bill as leverage. A compromise was reached, the LNWR gaining 4½ miles of the line at the Llanberis end and running powers over the rest. Work began again, and on 13 December 1866 there was agreement that the line should be jointly C&LR and LNWR. The branch opened for both goods and passenger services on 1 July 1869. The LNWR took over the line completely in July 1870. Carnarvon Morfa was a temporary station and was probably of timber construction. 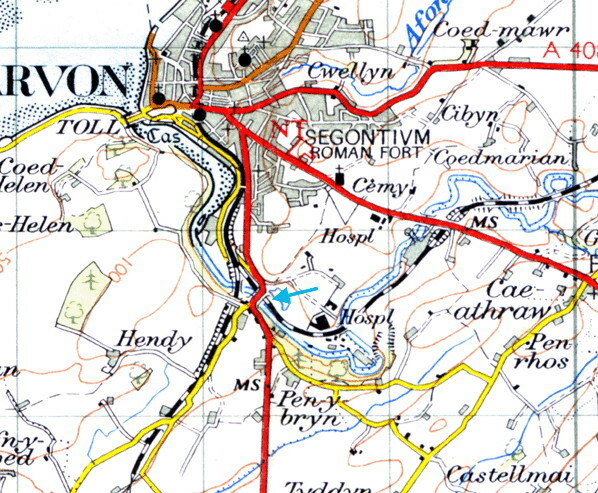 It was situated south-east of the town on the north bank of the River Seiont, just east of Seiont Mill Road. By 1869 Caernarfon had three termini, all of which had train services operated by the London & North Western Railway (LNWR). The other stations were Carnarvon (which had opened in 1852 and served the Menai Bridge line) and Carnarvon Pant (opened in 1867, and which served the Afon Wen line). Only Carnarvon was convenient for the town centre. On 5 July 1865 an Act was obtained for the construction of the ‘Carnarvon Town Railway’ which would link all of the three railways and allow Llanberis trains to run to the 1852 Carnarvon station. The line was just over a mile in length and included a tunnel of 163yd under the historic centre of Caernarfon. The new line also created a through route between Menai Bridge and Afon Wen. 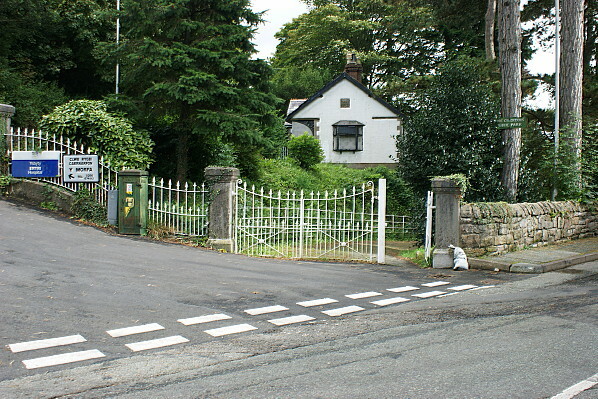 Passenger services used the new line from January 1871, and Morfa station closed; it was probably demolished shortly after. The line remained in use for regular passenger services until 22 November 1930 and for excursions until October 1963. The last goods train ran on 7 September 1964, and track-lifting commenced in February 1965. The site of Carnarvon Morfa station looking south-east on 28 September 2012. 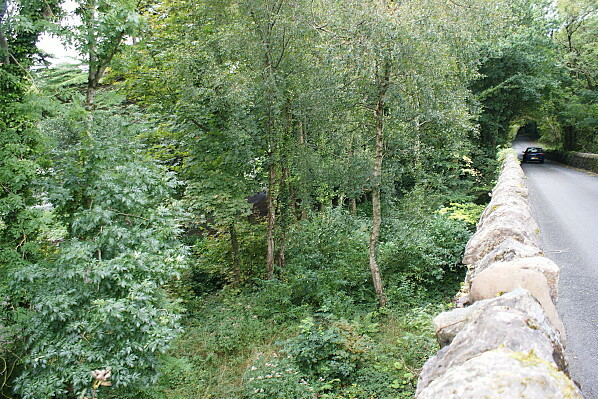 Carnarvon Morfa station was located in the area seen to the left of the wall. 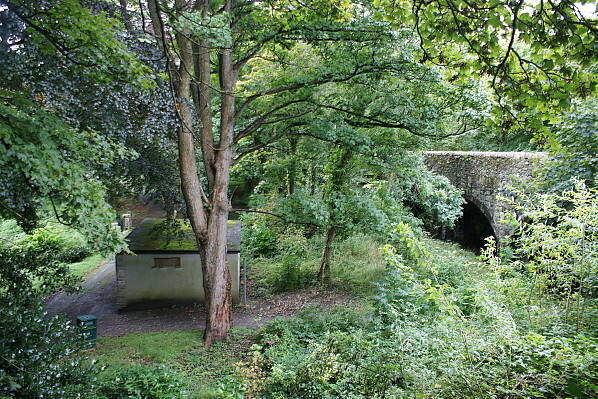 The view is looking south-east on 28 September 2012.
gates led to a recreation area.